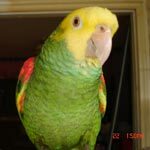 Parrot Forum • View topic - Bought a alexandrine parrot 6 days ago. Bought a alexandrine parrot 6 days ago. Hi I have recently bought an alexandrine parrot for our family. He seems so timid about everyone, he's very cautious when someone approached and wouldn't let anyone pat him. Also he will not come out of his cage on his own. I'm just wondering if he was maybe mistreated before and now is very cautious with people. Would he eventually be more relaxed? Or would he be this timid all the time? We can approach the cage and most times he moves away and turns his back on us. But sometimes he stays still and takes treat from hand. Also the step up is a definately no no at the moment. We just want him to be more relaxed around us as he's now a part of the family. Re: Bought a alexandrine parrot 6 days ago. Ignore him. Never look him full in the face. Keep your hands away. Fix it so he has a perch at your face level. That bird is scared and has the right to be. You took him from everything he knew and brought him to a strange place. I do not know his back round but I know we are giants with big hands. Hands can hurt little birds. To him you are a preditor. Talk to him. Sing to him. Spend as much time as possible in the room he is in. Give him a chance to adjust. Don't push. When he is ready he will come to you. Welcome to the forum! Now, we need a bit more information because the right advice depends on the bird's age and circumstances. Is it a baby that you bought from a breeder or an adult bird that used to belong to somebody else? How long have you had him? If he came from somebody else, how old is he and do you know anything about his background? What is he being fed? What is the daily routine? Housing?